The introduction of Electronic Work Diaries (EWD) will include long-distance bus and charter coach operators and presented as a voluntary alternative to written work diaries, the National Heavy Vehicle Regulator (NHVR) announced recently. The Transport Certification Australia (TCA) will head the certification process for industry introduction in early 2017 and NHVR will soon begin wider industry engagement with bus operators and telematics service providers to discuss this initiative and the opportunities it brings. "We are committed to ensuring heavy vehicles operate safely on Australian roads," NHVR executive director of productivity and safety Geoff Casey says. The recent passing of the Heavy Vehicle National Law Amendment Bill 2015 is the first important milestone for a more efficient recording process. "The bill’s introduction is the first part of many to a streamlined electronic method for recording work and rest periods, an essential safety requirement for heavy vehicle drivers," Casey says. "Ultimately, EWD will provide greater consistency, deliver increased productivity benefits and cut red tape." 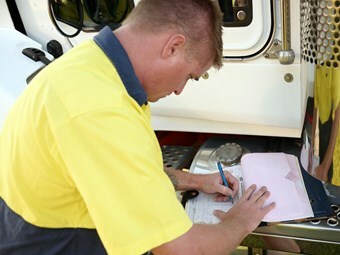 Drivers will still need to complete a written work diary for officially logging work and rest periods in the management of fatigue, but will be expected to make the switch to digital when the time comes. Although there is still a lot of work to be done, the likely date for industry introduction is early 2017.